Trent Owens, right, has found his calling. It's making cars go fast for drivers like Brian Vickers. So, like many of his peers, he turned his attention to being a crew chief. 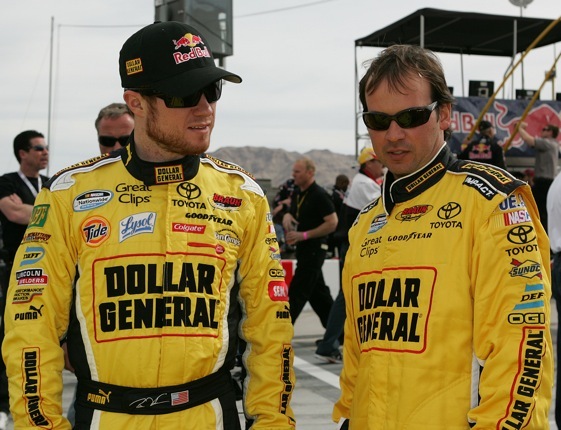 It’s a tough transition, no doubt, but ex-drivers tend to make some of the most successful crew chiefs. Ray Evernham, one of the best crew chiefs of all time, was a top Modified driver before an injury forced him down a different career path. Kasey Kahne’s crew chief, Kenny Francis, is a former Late Model driver. Sam Hornish Jr.s’ crew chief, Travis Geisler, advanced as far as the Nationwide Series before giving up driving. Frankie Kerr, an ex-sprint car racer, is the man behind the surprising results being posted by Marcos Ambrose. David Hyder, a former short tracker, had the Wood Brothers Ford up front for much of Speedweeks at Daytona. Owens, now the crew chief for Braun Racing’s No. 32 Toyota Camry in the Nationwide Series, first showed his skills as a crew chief the year after he stopped driving. He put together a rag-tag outfit for a young driver from Kansas, who had come to Nashville Superspeedway to make his first start in the ARCA series. It was Owens who planned the pit strategy that had the unknown rookie in position to be leading late in the race and eventually finish second. The driver was Clint Bowyer. Richard Childress was watching on TV that day, and the rest, as they say, is history – at least for Bowyer. Owens is still waiting for his call from a Cup team owner, but he is proud of what he accomplished that afternoon in 2003. “That was a good day for both of us,” he said. No doubt, success that day made it easier to move on from driving cars to working on them. As a driver, he made it as far as the Camping World Truck Series, and was set to run for rookie of the year in a truck fielded by Billy Ballew. But it just didn’t work out. All told, he made 12 starts in 2001 and 2002, then made the hard decision to hang up his helmet. Still, there’s a part of him that would like to be driving the cars instead of preparing them. He said that at times he gets as excited as he once did driving a car to its limits. “It’s not the same as when I was driving, but when I’m directing people, making changes to the race car and seeing the performance improve on the race track, I definitely get an adrenaline rush, especially when we’re leading or coming down to checkers,” he said. In many races in recent years, the No. 32 has been driven by moonlighting Sprint Cup drivers, which Owens says has helped him grow in his job. That Cup driver input also helps him make better decisions during races. This weekend, he has a Cup driver, Brian Vickers, behind the wheel for a race that is very special to him. Friday’s Diamond Hill Plywood 200 will be run at his home track, Darlington Raceway. Victory Lane at the South’s oldest superspeedway is just 10 miles from his boyhood home. Last year he came close to scoring a hometown win. He said that fast car was no fluke. Vickers said he’s confident Owens can give him a winning car.